Private Lesson Details: Private lessons are for 1 or 2 individuals in locations where our coaches reside. They are open to men, women & children of all ages and ability level. Instruction is tailored to your specific goals. 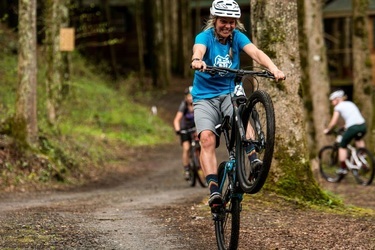 Beginner lessons typically emphasize the fundamentals of bike handling skills including braking & shifting, pedaling techniques, cornering, climbing, descending & positioning. Intermediate and advanced lessons often focus on honing the fundamentals and teaching skills such as front & rear wheel lifts, switchback techniques, jumping, dropping and pumping. You will have an opportunity to fill out a skills assessment and select what skills you would most like to focus on prior to your lesson. Our unique method of coaching allows you to progress quickly and safely while giving you a greater understanding of the relationship between you and your bike. We suggest booking a series of at least 3 lessons in order to see measurable results that will truly take your riding to the next level. Group Clinic Details: Group clinics are available for groups of 3-21 individuals in locations where our coaches reside. They are open to men, women & children of all ages and ability level. There are 1/2 day, full day & 2 day group clinic offerings. Each length clinic begins with the fundamentals and then tailors instruction to the ability level of the group. Half day clinics are a great way for those who have limited time to focus on improving a few skills in an outdoor classroom type environment, sometimes allowing time for a short trail ride. Full day clinics allow time to teach additional skills in the morning sessions and incorporate a longer afternoon trail ride to practice & hone those skills on-trail. Two day clinics allow for the ultimate progression. Your coach will start with fundamental skills and then progress you all the way to advanced level skills so that you walk away with a thorough understanding of what you are capable of on the bike. Each day will incorporate afternoon trail rides meant for dialing in technique, sessioning tricky sections of trail and finding your flow! Some examples of what we work on during group clinics: Perfecting body positioning and balance, technical climbing and descending, high speed cornering, switchbacks, berms, pump tracks, wheel lifts, bunny hops, wheelies, manuals, lunges, drops, jumps, up and over logs, large step-ups, pumping and flowing, racing... FUN!! 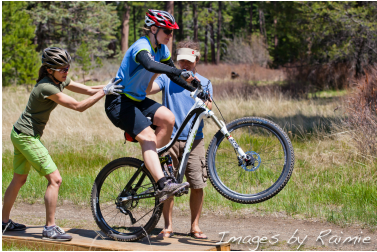 Custom Clinic Details: We can come to you for a clinic on your home trails or meet you in exotic locations for a special event, business retreat, you name it! If you would like a clinic somewhere other than our existing locations, send us the details & we will create a custom package. (5-21 People). Please start by filling out this form and we will be in touch shortly! All over the country! We have fabulous certified coaches in many parts of the U.S. If you are willing to travel a little, we can most likely set up a private or group lesson for you. Click here for a list of locations where Grit Clinics coaches reside. Check out the bios on our coaches here. I really appreciate Lindsey's honesty about the emotional aspects of riding and how she relates skills to other sports and life. What struck me the most is how engaging she is as a teacher. She helped me understand how to work with my bike in ways I never imagined possible and she makes learning so much fun. Not to mention she's smart, funny, super skilled and basically a total badass!! - Stacy K.
Meredith is an outstanding teacher! Fun, not intimidating, kind, and motivating. She instills confidence and meets you right at your level. She nails the instructions, breaking everything down well and giving you reminders exactly when you need them. It's a rare occasion to encounter such a great teacher. She's a huge reason why my first mountain biking experience was so fun. I look forward to our next lesson and highly recommend her! - Kristen G.